The Fire Sentry FS7 Flame Detector provides an intelligent two-stage response to semiconductor wet bench fires. The first-stage response to a small fire with a heat energy output of 3 kW (the equivalent of a 4-inch diameter polypropylene pool fire). Allowing time for the fire to self-extinguish. If the fire does not self-extinguish in accordance to the first stage, it grows to the Factory Mutual specified heat energy threshold of 13 kW (the equivalent of an 8-inch diameter polypropylene pool fire), where by the second-stage response is activated. The Fire Sentry FS7-2173 is used with Fire Sentry FS7-130-SX Controller or Control Panel FSWB. The Controller and Control Panel supply power detectors monitor the status of all detectors and communicate with the detectors via the digital RS-485 communication channel. The Fire Sentry FS7-2173 is supplied with a 20 ft. standard cable connector. Connected to the controller or control panel using the self-locking connectors and Fire Sentry junction boxes are connected to the detectors. These then allows for fast and easy connections thereby eliminating problems such as wiring. The ability to store six times its capacity, the date stamped FirePics (pre-event multi-spectral sensor array data) can store each detector in a non-volatile memory. The controller and control panel is capable to store event history table in the non-volatile memory. This contains the time and date stamped alert, alarm and fault histories. FirePics and event histories can be retrieved from the controller or control panel at a later date. The Fire Sentry FS7-2173-2RP unitizes the model's microprocessor. The algorithms continuously process with digital signal monitors, sensor's built-in self-test and verifies proper circuitry operation. 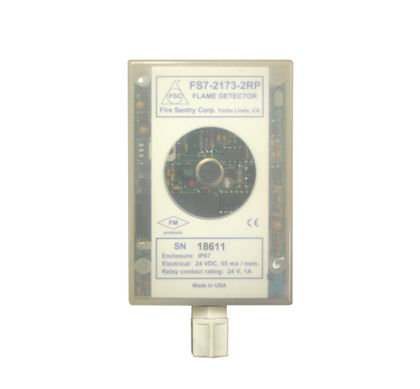 With discrete to the Fire Sentry FS7-2173-2RP relay outputs are designed to operate as a stand-alone detector and any approved fire alarm panel with interface. The detector requires an external 24 VDC power source and is supplied with a 20 ft. pigtail standard cable. Store up to six time the date stamped FirePics and 200 events in non-volatile memory. FirePics and event histories can be retrieved using a Fire Sentry FS7 Interface Kit and the Fire Sentry Windows-based PC software.